Kawasaki Heavy Industries (KHI) has developed a ship fuel tank that can store up to five times more liquefied natural gas than the existing model. The adjustable box-shaped tank, which stores gas that has been liquefied and cooled at minus 162 C, can carry anywhere from 2,000 cu. meters to 10,000 cu. meters of the fuel. Dividers inside the tank boost resistance to turbulence. 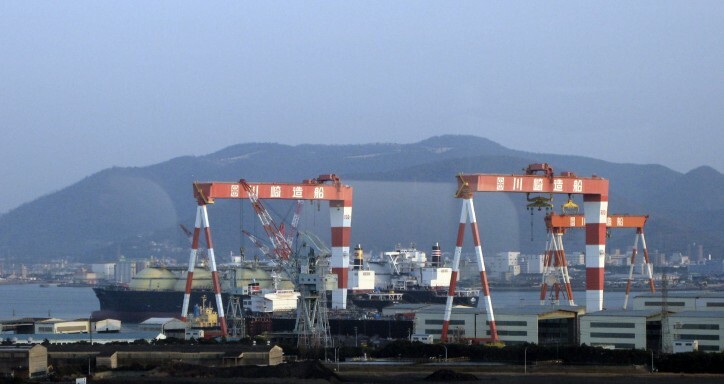 The Japanese company will spend a year commercializing the product, with the aim of supplying containerships or car-carrying ships used in long-distance shipping. Currently, tanks on LNG-fueled ships are barrel-shaped and most hold less than 2,000 cu. meters. International regulations on emissions of sulfur oxides, carbon dioxide and nitrogen oxides are becoming tighter. As a result, Kawasaki Heavy expects demand to increase for vessels powered by LNG, which has a smaller environmental impact.